Morgan James Publishing, 9781642790917, 210pp. Who Said I'd Never Dance Again? is a story of determination and resiliency that inspires and gives hope to anyone who might be facing joint-replacement surgery. Facing hip replacement surgery can be frightening and depressing for anyone--especially a competitive athlete enjoying success--and picking up a book about what lies ahead can be downright daunting. There are countless stories of athletes who have had career-ending injuries and surgeries. Until recently, no one watching competition dancers imagined that someone with an artificial hip could move so deftly on the dance floor. Many viewers don't have the physical ability, flexibility, or stamina to dance with their own joints, let alone an implanted one. Who Said I'd Never Dance Again? 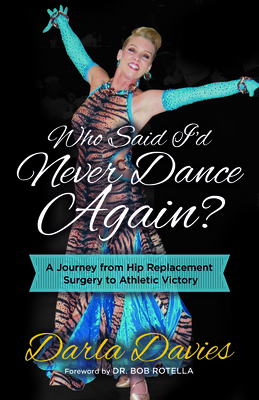 is the first book about ballroom dancing to address a painful, yet victorious comeback after joint replacement surgery, and the rigorous physical and mental strength required to make it happen. Ballroom dancer, Darla Davies shares her story as the only competitive athlete and ballroom dancer to claim the United States Pro Am American Smooth Championship title, succumb to hip replacement surgery, and then fight back to regain the national championship in less than three years. Who Said I'd Never Dance Again? teaches readers the warning signs for hip replacement, how to alleviate the fear of facing surgery, dos and don'ts after surgery, how to restore joy, passion, and fire after an enormous physical setback, and more Darla's quest for athletic victory gives readers a glimpse of the less glamorous side of ballroom dance competitions and shows all athletes that it's never too late and that no one is ever too old to pursue their dream.